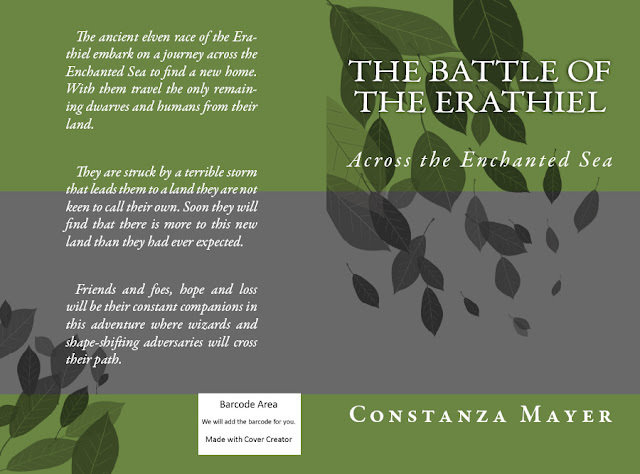 The Battle of the Erathiel: Across the Enchanted Sea is a great read for anyone who enjoys a good fictional story! The author jumps right into the story, right from the beginning, which makes it very hard to put the book down, because you’re wondering who these characters are and what is going to happen to them. From the first chapter we learn about the big storm that causes huge chaos and despair and the story line evolves from that. The style of writing reminds me of the book Narnia with a dash of Lord of the Rings. It takes you to a place so far from reality that you forget about the rest of the world and all your problems go away for the time being. Constanza Mayer, the author of The Battle of the Erathiel: Across the Enchanted Sea, is very talented writer and an inspiring artist. She has traveled a lot in the past and lived in many different cities and she had to start over from scratch each time. She gave up a great job that gave her lots of joy to write this story, which takes a lot of courage. She gets her uniqueness and strength from her past life experiences and she uses them to entertain and teach people something new. Read our interview with Constanza Mayer at TheCrazyMind.